Our story begins with convict Jackson T. Winters, a man just trying to survive his time in prison. One night he hears gunfire and the sounds of a riot. He is broken out of prison by a heavily armed woman named Anderson Lake. Lake knocks him out and takes him to the mansion of millionaire Markus Schrecken. Schrecken knows of Jackson's reputation as a thief, and wants him to steal a ghost from the supposedly haunted Trask Mansion. Winters doesn't have much choice but to agree, since the alternative is going back to prison. Winters sets about assembling a team, including pickpocket Oliver King, stage magician Robby Trick, ghost hunters Jay and Joe Burns, and psychic medium Edzia Rusnak. Together they enter the mansion during the day for an exploration, knowing that "bad things" usually happen there only at night. However, when they ask Edzia to use her psychic powers to detect ghosts, she sees dozens of them swarming around -- but tells the team she doesn't see a thing. This was an engaging, off-beat story that has mildly occult themes with a dash of twisted, dark humor. Winters seems like a typical anti-hero, just trying to survive the deal he's made. The team he has assembled definitely seems interesting, and I've already taken a liking to Anderson Lake, the secret-agent type character. She and Winters verbally fence a little bit in this issue, and although it isn't much, there is a definite promise there of some interesting dialogue to come. The rest of the team is varied and I'm definitely curious to see how each of them contributes to the future storyline. 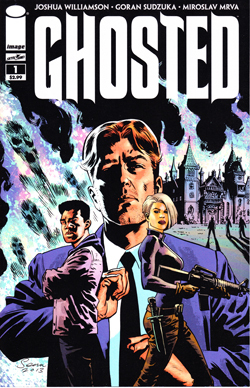 The basic premise of the comic is interesting, mixing criminal and ghost hunter elements. The idea of "stealing a ghost" is quite clever, and what I perhaps like best is that the team currently has no idea how they're actually going to pull off this "heist" -- how exactly does one steal a supernatural being? The plot moved forward very well, and was extremely well paced, but the ending seemed kind of... abrupt. I understand that it's supposed to be a cliffhanger, but I felt like hardly anything had happened by the time the issue ended. On the other hand, one major question is the potential for longevity in this series. The premise, though interesting, seems like it would provide material only for a single story arc. Under the terms of the deal, once this single ghost is captured, Winters goes free -- and gets to stay on a private island where he will never want for anything. Unless Schrecken backs out of the deal, or something else happens, it's hard to see how this team ends up staying together long-term (especially regarding Anderson). Comics companies these days are decidedly coy about whether "ongoing" series are really intended to go for years or whether they are planned as limited-run entities or long mini-series, so maybe Image plans this as a limited series and just hasn't told us so. But if the plan is for this to go long-term, I'll be looking for something to cement this team together. Otherwise the currently good premise will probably fall apart. The art on this book was quite good. I enjoyed Sudzuka's style immensely. His layouts are fairly traditional, but he does a good job with "camera angles" to provide the proper emotional impact in each scene. And his double-page spread of the haunted mansion is simply spectactular. He does his own inks, and provides heavy blacks to increase the moody nature of the story. Overall, this is a well-done comic-book. The art and story taken together were interesting and worth a read. I'm not sure how much longevity this series will have, but they definitely have my curiosity pricked, and I will be along for at least the first story arc.